Do you ever get stuck in the traffic? Do you know how difficult it is to pass the time when you are stuck on a road with a lot of vehicles around you? Well! the people of Karachi have to face this problem almost everyday. This is actually because of the poor traffic management by the government and the people themselves. 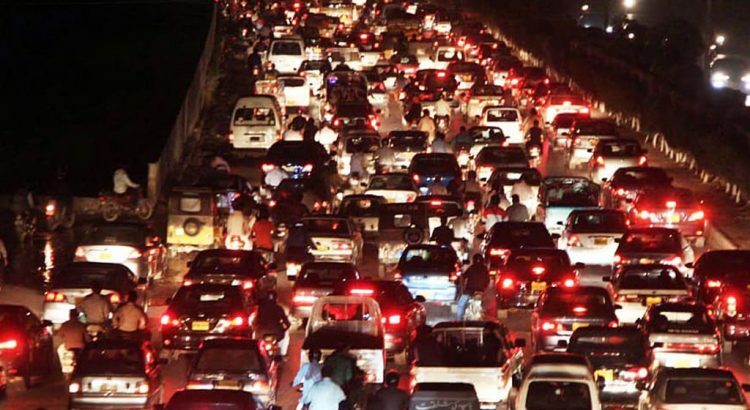 Let us here look into the main reasons that has lead Karachi to face the traffic problems. Well! Karachi is a very populated city.The population of Karachi is increasing rapidly that in turn is increasing the number of vehicles for the people. The number of vehicles both; public and private, has increased to such an extent that the roads of Karachi have fallen short for them. Seeing, the number of the vehicles we can easily say that Karachi is in a dire need to construct wider roads so that this great number of vehicles may be accommodated by it. The city of Karachi is known for its great channels of roads. All over Pakistan people talk about Karachi for its wonderful flyovers and underpasses but with the increase in traffic at Karachi these underpasses and flyovers are failing to give the desired results. So, In addition to these government must make seperate bus routes for buses so that they may stop using the road instead. The government must also install more signals for all over traffic for a good management. Well! these are just the suggestions that are not going to be worked on by the government. Government is actually least concerned by the traffic situation of Pakistan and takes no good steps to solve this problem. The other factor that adds to the traffic of Karachi is increased number of pedestrians. You must be thinking what am I talking? What do they have to do with the traffic, right? Well! in Karachi people do not consider roads as roads rather take them as zebra crossing that works for 24 hours a day. So, they keep on walking on the roads not considering the fact that they are causing a problem to those who are driving the vehicles. Moreover, the beggars and hawkers also add much to the misery of the drivers. The other big factor that can be considered as the great cause of traffic to be the stalls that people set up on the roads. These stalls take in much of the space of the road that in turn works as the impediment for the vehicle drivers. These stalls include; tea stalls, food stalls and Chinese items stalls. We must let you know that this happens mostly at the roads which are likely to be packed with traffic. The stall setters consider such roads to be the places that would help them to do better sales or business. Even though it is unlawful to set up the stalls on the roads yet the government takes no step to stop these stall setters. The people of Karachi do not consider the fact that roads are not the place to park their cars on. They do not care as to how their ill parking ways can cause problems to others. The main roads of Karachi are luckily free from this problem but the inner narrower roads are always filled with the parked cars. Moreover, these people are so ignorant that they do not even care about the “No Parking” sign boards. Here it is to be mentioned that the government also plays an important part in this regard. You must now be wondering how? Well! they do not have enough number of traffic police that can look over the parking ways of the people. Moreover, the people are not fined right for the negligence of the policemen or for their greed to get the bribe. Government does not have a good check on the policemen that adds much to the misery of the people that happen to be driving vehicles on the roads of Karachi.